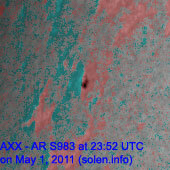 Last major update issued on May 3, 2011 at 04:30 UTC. 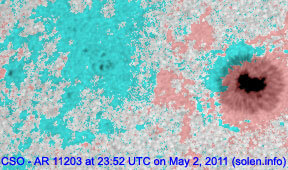 The geomagnetic field was unsettled to minor storm on May 2. 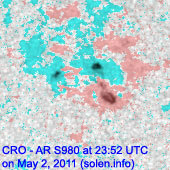 Solar wind speed ranged between 575 and 766 km/s under the influence of a high speed stream from CH446. 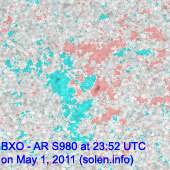 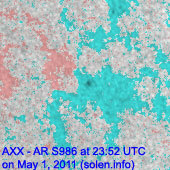 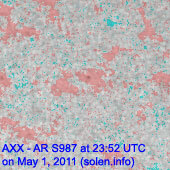 Solar flux measured at 20h UTC on 2.8 GHz was 109.8 (increasing 0.6 over the last solar rotation). 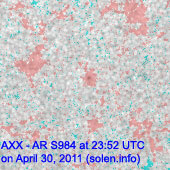 The planetary A index was 20 (STAR Ap - based on the mean of three hour interval ap indices: 20.5). 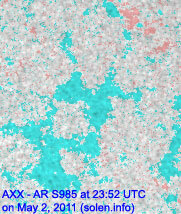 Three hour interval K indices: 35433333 (planetary), 34433323 (Boulder). 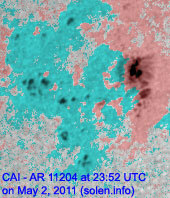 Region 11200 developed slowly and quietly. 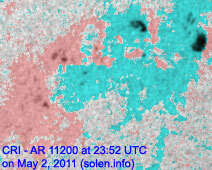 Region 11203 was quiet and stable. 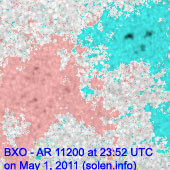 New region 11204 emerged near the northeast limb on April 30 and was numbered by NOAA/SWPC two days later. 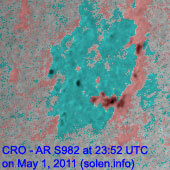 The region developed on May 2 and could produce C flares. 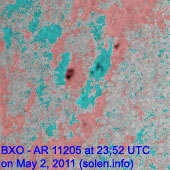 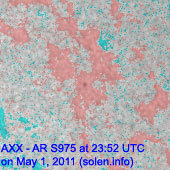 New region 11205 rotated into view at the northeast limb on April 30 and was noticed by NOAA/SWPC on May 2. 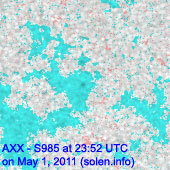 Slow development was observed on May 2. 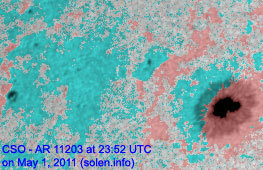 A filament eruption was observed starting near 16h UTC in the southeast quadrant. 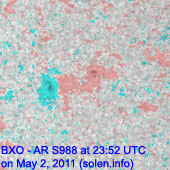 A small CME was observed off the east limb. 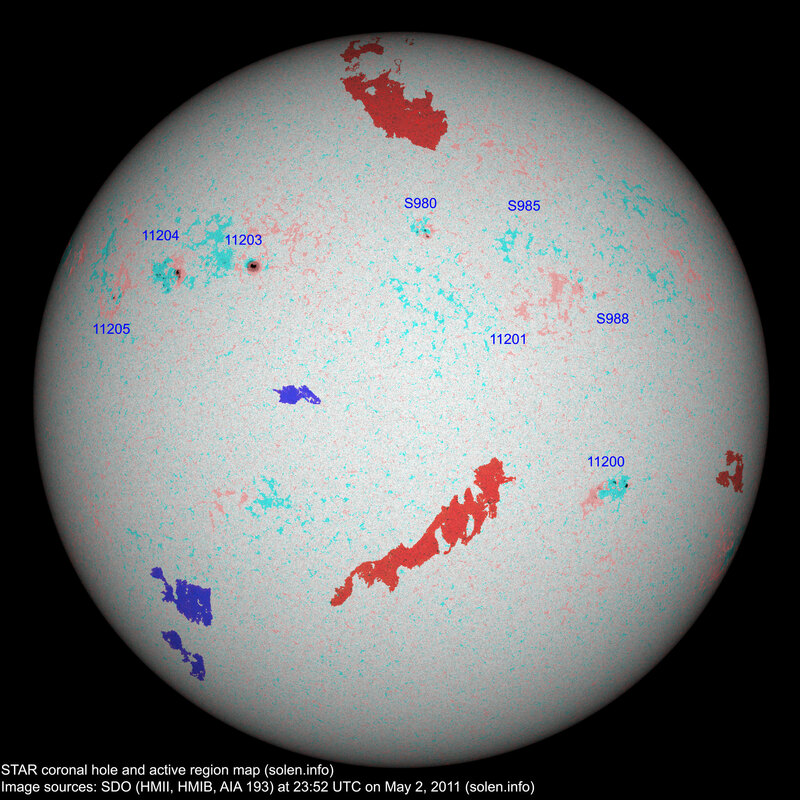 The geomagnetic field is expected to be quiet to active on May 3 due to effects from CH446. 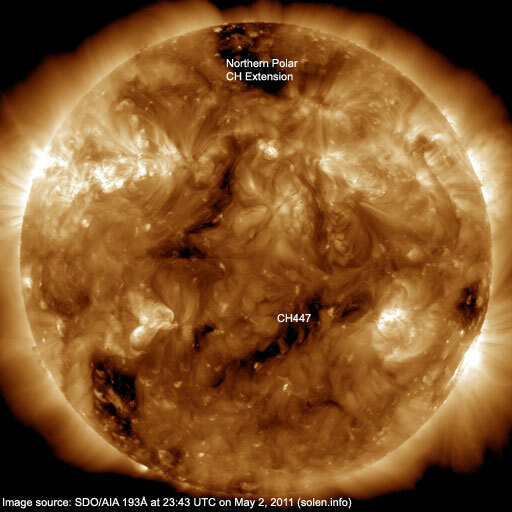 Quiet conditions are likely on May 4 while there is a possibility of unsettled intervals on May 5-6 if a coronal hole stream associatred with CH447 arrives.